This wonderful Kereru (NZ native wood pigeon) was quite happy for me to take it’s photo. I got 3 or 4 of it while it was perched here despite the fact that I had a group of 6 noisy school kids nearby. I was thrilled to spot it and even more thrilled to get photos. When it flew off it actually flew so close to me that I felt the breeze from it’s wings at the top of my head! What a buzz for a bird fanatic like me! I took this in a walk through aviary at Hamilton Zoo and although we had to rush in this trip I will be doing a very slow walk through when we go back as a family. I saw a Weka in another part of the Zoo (although it was not as photogenic!) and I’d never seen a Weka before (except for on the Tv) so I was doubly happy! 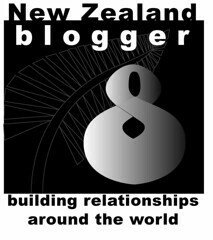 I did a quick google search on Kereru before this post and I found this great site which I hope you will check out. It has several short Kereru videos including one so drunk on fermented berries it actually falls out of the tree! There’s a longer video on the home page that shows some of the stunning forest’s that Kereru and many other native birds live in if you feel like a bit of “bush walking!” I also found this video clip on YouTube of a Weka going about it’s daily business. The Weka looks like it’s a cross between out native Kiwi and Pukeko’s. In the background you can also hear the call of a Morepork. This Damselfly seems to be looking at me, looking at it! Such beautiful a blue insect! It’s clinging to a much bigger flax (Harakeke) leaf at ‘my’ other pond, the 2nd and less visited one I discovered at Easter. I like the tiny shaddows cast by it’s legs too.The last time I posted one of these I said it was a Dragonfly and I was quickly put right by fellow bloggers, this time I hope I’ve been a good student! Thanks also to my UK visitors who names the dried thistle heads for me…Teasles! Cute name for a bunch of prickles! It’s hard to image such a beautiful and serene place being the place of a one of NZ’s hardest fought land wars but on April 29 1864 that is exactly what happened here. The battle was hugely significant for both Maori and Eurpoeans not just in terms of land ownership but in terms of race relations. Most people who travel the busy main road (Cameron Road, named after General Cameron who led the Imperial troops) will pass by unaware of the signifance of the day and the site but I know I for one will be stopping by to say a quiet thankyou to those that gave so much. Things have changed ofcourse and these days this land is for all people and it is the inheritance of all NZ’rs regardless of origin. If you wish to you can read more here. April 29 is also the day for blogging about WORLD HUNGER. However I am going to take advantage of the timezone difference for that! Watch this space! The words ‘world famous…in New Zealand’ were part of a nation wide television advertisement for L&P a few years back and they’ve become almost as famous as the drink itself. The letters L&P stand for “Lemon & Paeroa” and Paeroa is the town it is brewed in. The addition of “Paeroa” to the name though actually comes from the fact that a natural water spring is used in the making of this drink. It quite litteraly contains part of Paeroa! Stopping for photographs at this bottle is the ‘done thing’ when you go to Paeroa and has been for many years. One day may even dig out and scan the photo of me standing by the bottle when I was young girl! You can find out more about Paeroa here if you wish to read on.